5 Easy Ways to Help Pass Laws for Animals—from Your Computer! We know that you care about animals and want to protect them from cruelty and exploitation, but that it can be hard to know where to begin. And in this hectic world where so many of us have precious little free time, is it even possible to make a real impact in just minutes? We say “yes, it is,” and we’d love to show you how. The explosion of online social media and mobile technology means that advocating for stronger animal-protection laws has never been easier. 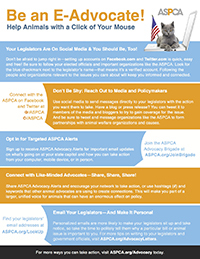 We’ve collected our top five tips for social-networking newbies in an informative, one-sheet E-Advocacy Guide that you can download or even print and distribute to like-minded animal lovers! Concerned that legislators and policymakers don’t take online advocacy seriously? In fact, the opposite is true: a recent survey of House and Senate staffers revealed that social media interactions are indeed viewed as authentic communication—and even just a few comments from constituents on platforms like Facebook and Twitter are enough to capture their attention. With the new year comes new legislative sessions in D.C. and in states coast to coast—the time to get started is now. Please download our free E-Advocacy Guide below! Download our 5-step E-Advocacy Guide [PDF/JPG].